You don't need a big camera in order to take crisp, detailed and balanced pictures. Premium compact cameras aim to be the best of both worlds: small like a point-and-shoot; powerful and programmable like a DSLR. That's the space the Panasonic Lumix DMC-ZS40 fits in. At $449 retail, the ZS40 is expensive for a compact camera. Its price though, can be justified by its impressive set of features—a 30x zoom, 24-720mm f/3.3-6.4 lens, 18MP sensor, electronic viewfinder, optical image stabilization, WiFi, GPS, RAW capture, and a host of manual controls—great image quality and easy pocketability. The ZS40 is only 4.4 x 2.5 x 1.3 inches and weighs just 8.5 ounces. Picking up the camera, I was immediately struck by how easy it is to hold securely, thanks to the small handgrip on the front and rubber thumb rest on the back. My fingers settled into a comfortable hold with my index on the shutter without effort. And even when I extended my arm to get shots from difficult angles, I didn't feel in danger of dropping the camera. This is necessary for anything other than straight on shots, since the 3-inch LCD on back is fixed and does not flip up or out. Other than that disappointment, the 920K dot screen is wonderful for framing shots indoors and out. The rear screen isn't your only option. There's also an integrated electronic viewfinder (EVF) that's not quite half an inch wide (so smaller and not as comfortable as those on DSLRs). Since it's electronic you'll see much of the same information displayed as you do on the LCD. While a nice addition, I only used the EVF in specific circumstances, such as in really bright sunlight or when I wanted some extra help keeping the camera steady when zoomed out or while taking macro shots. Otherwise the LCD was much easier on my eyes. The interface on the LCD provides a lot of detailed information--sometimes too much. The visual design feels cluttered and technical, which is not necessary in Auto mode. At least you can dismiss all or some of this data and just shoot, if you want. The shooting mode dial on top includes plenty of options for basic and advanced photographers. The Intelligent Auto was excellent at detecting which mode I needed and adapted to changes in lighting and the situation quickly. Or, if you know for sure what you need, you can switch to a specific Scene Mode. There are 18 to choose from ranging from the typical (sports, portrait, night) to a few very specialized ones (high sensitivity, through glass, starry sky). There's even one for taking 3D pictures and a high speed movie mode. In addition, the ZS40 includes a Creative Control mode with filters and effects that make it easy to add artistic or dramatic flair. Panorama Shot gets it's own place on the dial. The rest is for more advanced modes: Program, Aperture Priority, Shutter Priority, Manual and two clicks for custom settings. Switching between scene modes and creative filters is a little involved, taking more than just a turn of the dial since there are so many modes to choose from. However, I usually stuck with Auto and most of the time the pictures came out the way I wanted. I did my initial testing using Auto and Scene modes to see how well the ZS40 would work for people with basic photography skills. The pictures I took outdoors were well-exposed, sharp and color-correct. However, even in the best lighting conditions, I sometimes had trouble getting the ZS40 to focus exactly where I wanted. The autofocus is fast in general, but when taking pictures of faraway or very close up objects, the camera didn't always pinpoint the right area at first. This was most apparent in close-up shots, even when Auto recognized that I needed macro mode. It's possible to set the autofocus area manually (I assigned this function to one of the buttons on the back of the camera). This solution isn't as good as tap to focus on a touchscreen, which the ZS40 doesn't have and is found on other high-end point and shoots. The 30x zoom lens on the ZS40 is impressive, not least because it doesn't add much bulk to the camera. When zoomed out all the way, Panasonic's optical image stabilization was a huge help and made it possible to shoot sharper pictures than I can normally get while holding the camera in my hands. Pulling the ZS40 close and using the viewfinder also helped stabilize shots. Of course, nothing is as good as using a tripod. Indoor shots took more effort. Though the ZS40 has a fast shutter, the shutter speed didn't always keep up with the lighting conditions in the Auto modes. In medium and mixed light, people needed to stay perfectly still in order to not end up blurred in the picture, and during a party no one wants to stand still. Even with relatively stable subjects, the pictures weren't as sharp as those I took outside. The flash proved to be not too harsh on skin tones and I got some crisp shots with it on occasion. It's just obvious which pictures were taken with the flash. In low light the camera adjusted to a higher ISO automatically in Auto mode, and with that came more noise and less crispness. Low-light images taken with Night and similar modes did turn out well. It just took several tries to get the exposure I wanted. This is easier in advanced setting modes (P/A/S/M) because the ring around the lens can be programmed to adjust exposure. The ring doesn't work the way in Auto. All of the issues I encountered shooting in Auto went away once I switched to Program or another advanced mode. This is true of any good camera--Intelligent Auto is a basic tool, even when it's as advanced as Panasonic's. More powerful mirrorless ILCs and DSLRs often do better on Auto, which is why people gravitate toward them even when they only need to use a camera every once in a while. The Lumix ZS40 is capable of taking sharp, low noise images in any lighting condition, provided you step outside of the Auto comfort zone and learn to adjust certain settings yourself. 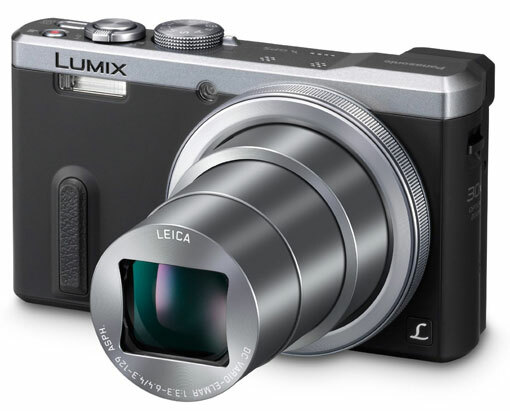 The Lumix ZS40 includes both WiFi for uploading images and GPS for geotagging them. The GPS took about two minutes to nail down my location before I downloaded the available assist data (which can be done directly to the device via WiFi). After downloading it, the camera found GPS satellites a little faster. Geotagging is useful if you're in unfamiliar territory and want to map your adventures later on. Just be aware that if you upload pictures publicly, the location might end up being public, too. Uploading images directly to social networks and cloud storage is possible, but the setup is so tedious and complex that it's far better to do this through the Android or iOS app. Connecting with the app is simple--particularly on Android--and only takes a few minutes to set up the first time. The Panasonic Image App isn't the slickest-looking app and it's not always completely intuitive. The basic functions are never more than two taps away, at least. And it doesn't take long to get the hang of it. Picking images to transfer from the camera to your phone or tablet is easy and straightforward. The transfer itself doesn't take long, though I wish you could pick more images at a time. The remote viewfinder function is one of the best I've ever used. You can control zoom, access a few advanced settings, tap to focus, and snap a picture or start recording video (something most apps can't do). The camera can record 720p and 1080p video in AVCHD or MP4 format, plus high speed video at 720p or 480p in MP4. Videos come out sharp with smooth movement and no stutter. You can use the full zoom range when recording, just know that you can hear the lens moving if you change the zoom while recording. Autofocus is fast, but continuous autofocus can take a while to find the central subject, especially when the subject is a person moving around quickly at a distance. The built-in stereo mic is all you have for audio--no external mic input. It's good enough for recording voices indoors and cuts down on wind noise when recording outside. The audio quality is average, so it's not the best for recitals and concerts. The pictures the Panasonic Lumix DMC-ZS40 takes are by far better than the average point-and-shoot or smartphone, even when in Auto mode. However, at this price, you want to get the best pictures possible. If you're not comfortable working in one of the advanced modes and you want to take pictures both indoors and out, the ZS40 isn't the camera for you. If you're willing to learn, the ZS40 is worth it. With just a few adjustments you can capture beautiful pictures in any situation.